This engraving from an 1896 advertisement shows Lower Mills as notionally seen from the top of St John’s church tower. To the right can be seen the cottages in Oldham Street. Some parts of the mill ‘square’ remain incorporated into the modern mill but the rest has gone in the redevelopment of the mill over the hundred and ten plus years since the picture was drawn. However, the hexagonal stone built chimney remains, if rather shorter than it was. The hills are stylised, they don’t look like that at all! Notice the mill pond between the mill and the hills. The houses up the hill above the left of the pond probably represent those up Lord Street. While the background may be fanciful, experience tells us that the image of the mill buildings themselves are likely to be fairly accurate. The Google map shows the modern mill. The picture above is taken looking south while the map has north at the top. Zoom in and notice the shadow of the chimney near the bottom of the mill site. The church tower is towards the top right. Lower mill (not to be confused with Lowerhouse mill) was built in 1792 by George Antrobus, and passed on his death in 1820 to his son Philip Antrobus. In 1830 it was let to John Shaw Astley, in 1832 to Thomas Creswick (a relation of the Oliver family at Waterhouse mill) and John Harrop. The Trustees of Philip Antrobus (d.1830) let both Higher and Lower mills to Messrs Swindells and Oliver. George and Martin Swindells II took Lower mills on their own from 1859. All of these occupants were spinning or otherwise processing cotton. The mill was bought by Henry & Leigh Slater in 1875 who converted it to paper coating. In the latter 20thC it passed to Tullis Russell, an employee owned business, who continue to operate the mill into the 21stC as a paper coating mill. 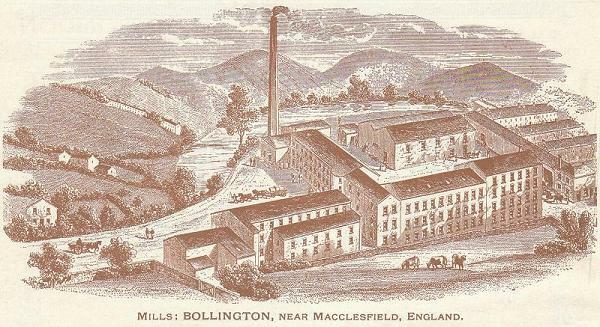 It is unique in Bollington that a mill continues the same industrial process for as long as 140 years. Today (2016) while some of the buildings are old they contain very modern paper processing technology producing high quality products being sold around the world. Approximately 100 persons are employed at the mill in 2016. Lower mill was originally water powered with a mill pond beside the mill. Most of this has been filled in in modern times and is now used for the staff car park. See the page on mill ponds. Later the mill converted to steam power with a delightful octagonal chimney which stands to this day in its original position. This mill has two access points – one in Palmerston Street used today for product despatch, the other at the south end of Church Street where it meets Lord Street used for delivery receipt.